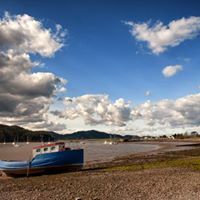 Clonyard is situated between the villages of Rockcliffe and Kippford in a secluded position near the solway coast. Numerous small villages are dotted around the countryside, each with it’s own individual charm. The country town of Kirkcudbright is well known in art circles for its historical connections with the ‘Glasgow Boys’. Castle Douglas is the local market town and now prides itself on having the reputation and title of Galloway’s “Food Town”.